Sometimes you just don't want to cook. Sometimes you just don't want to go out and pick up the food. Sometimes pajamas are the dress for the evening. Sometimes you don't want to interrupt your great party, have the munchies, and you need to have the food prepared for you and possibly delivered. 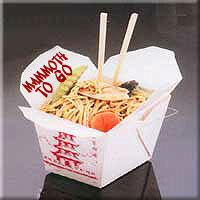 Sometimes take out in Mammoth is just what the evening needs. When you're talking fast food in Mammoth, you're talking the restaurants you can walk up and pick your items and off you go. Yes, even though we are rural, we love our food and while you can get almost anything from any restaurant, these fast food restaurants in Mammoth serve up the fare. Long time favorite Nick and Willies has pizzas cooked or take and bake. Thai'd up serves.. well, you know, and you can get Mexican, pizzas, or how about delicious roast chicken and rosemary potatoes or tacos on homemade tortillas. Now we got our favorites... and you will to, you'll just have to try them all to make your own list. Here is what we know at the moment. Chow Down, Chow Hound! From Chinese, to Thai, to ready made gourmet delicacies, you can get almost any meal in a take out box. These Fast Food Restaurants in Mammoth Lakes specialize in real food, real fast. Ready to throw on some clothes and get out of the house? These are other restaurants in Mammoth Lakes.